Hi! My name is Laura Wirkkala. I have always been interested in handcrafts. 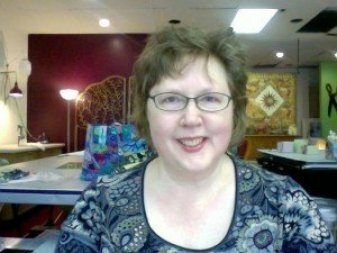 I started embroidery by age 8, then knitting and crocheting. My grandmother was always doing craft projects with me and my siblings when we would visit her in Northern Minnesota. In Middle School, we took Home Ec. One quarter was dedicated to cooking and the other to sewing. I didn’t get the sewing bug the first year because we made strange projects. One was washcloth slippers and the other a pillow case. I got hooked on sewing in 8th grade when we made our first piece of clothing. It had to be without zippers or buttons. I made a top with an empire waist, elastic above and below to bust and sleeves gathered into the armhole (armscye) and at the bottom, leaving a small ruffle below the elastic. The fabric was a faux patchwork in red, white and blue (denim). Very 70′s! I continued making clothing pretty exclusively for the next 10 years. Being 5’10″ encouraged me to sew. I finally branched off into curtains and futon covers and home projects in the early 80′s and then started my first quilt in 1985. I hand-quilted it over 4 years time. I finished it around 1991 and entered it into a national contest. It won on the state (Massachusetts) level, so I was happy about that. I have since given it to my mother. I have a degree in Flute Performance and then got a teacher’s certification in K-12 Instrumental and General Music. I moved to Massachusetts, from Northern Wisconsin, in 1989 to apprentice to a world-known flutemaking company. Shortly after I started making flutes, a colleague commissioned me to make a flute case cover for him. He sold it to a friend and I had a business. I worked on it part-time for many years. In 1996, I developed a severe case of tendonitis in my right shoulder. I had to leave flutemaking, but after a 1.5 year recovery, was able to resume sewing. I have taught music lessons since 1980. Yet, I have never felt the same passion for music as I do for sewing. In my free time, I will devour sewing magazines and books. I love going to fabric stores and imagining all of the beautiful and fun things I can make. I am not formally schooled in sewing. Yet, I feel like my experience is wide-ranging and thorough. Many times, when I needed employment during college and beyond, I turned to sewing. I have worked in several fabric stores, have hemmed pants for a men’s clothing store, done custom sewing and tailoring, repaired sails for boats and made custom canvas covers for a sail loft on Lake Superior, I lasted 3 weeks on an assembly line for Munsingwear before I couldn’t take the monotony any more. I learned from every experience I have had. The production-line experience taught me about economy of motion and how to rip out seams quickly. I learned how to make patterns, how to sew for strength, how to fix mistakes from the sail loft job, along with learning how to sail. Making quilts and taking classes about them, attending lectures at the quilt guilds I have joined and being open to others suggestions and hints, have given me a huge repertoire of techniques and tricks to make sewing easier. I have been able to customize my teaching to the students needs and learning style. I love to pass on what I know and open a creative realm to others to enjoy.